DeSilva+Phillips client CatapultWorks, Silicon Valley’s largest integrated marketing services agency, has been acquired by R2integrated, a national full-service digital agency backed by ORIX Private Equity (8591:Tokyo). CatapultWorks brings over two decades of creative, content, media, data and teleservices expertise to r2i’s elite digital and marketing technology cloud offerings. The acquisition brings together the capabilities, strategic partnerships and expertise of the two agencies that serve a national client base of mid-tier, enterprise and Fortune 500 brands. For CatapultWorks, this acquisition adds strategy experts across the marketing spectrum; doubles their team and resources; expands their web, digital, social and mobile offerings; and increases their breadth of marketing cloud technologies. CatapultWorks is located in the heart of Silicon Valley, and adds its seasoned leadership team plus over 80 employees to r2i’s offices giving the agency more than 200 marketing professionals with experience in enterprise marketing cloud technologies, advanced data management and analytics, multi-channel marketing, content development and creative services. In addition, CatapultWorks brings integrated lead development services via its demand generation and call center services which complement r2i’s digital and interactive service offerings. “We share a belief in the power of technology and the execution of data-driven marketing campaigns,” says Matt Goddard, CEO of r2i. “Combining our services and teams gives us enormous leverage in what we can do for our clients and positions us as a very competitive, comprehensive agency for mid-tier and enterprise customers.” The CatapultWorks client base of blue-chip B2B companies as well as enterprise consumer, clean tech and energy brands blends well with r2i’s portfolio and allows the agency to bring deep experience to nearly every vertical market. 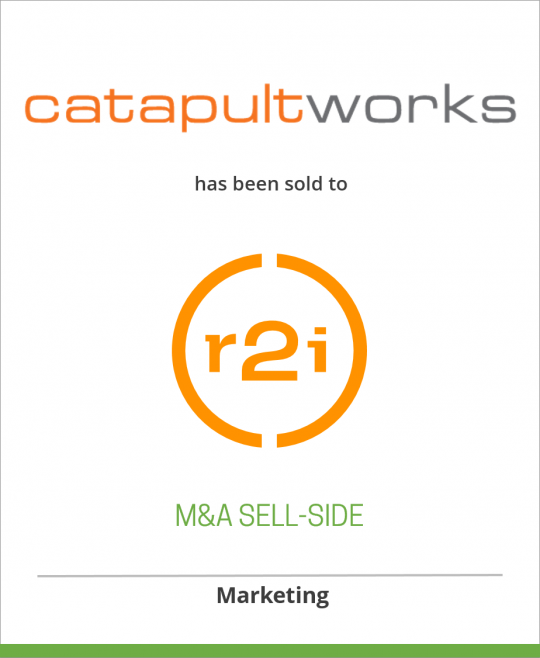 Acquiring CatapultWorks is a significant milestone in r2i’s growth. The company has been rapidly expanding due to strategic partnerships with marketing cloud platforms such as Adobe, Sitecore and Acquia Drupal. With this acquisition, r2i is able to accelerate additional partnerships with marketing automation leaders like Marketo and Silverpop. R2i is expected to announce additional acquisitions in 2015. About R2integrated: R2integrated (“r2i”) is a high growth, full-service digital marketing and technology agency specializing in creating meaningful customer engagement in the ever-changing world of peer-to-peer interactions and complex technology requirements. With a focus on integrating the right marketing technologies to deliver customer-centric campaigns, r2i delivers solutions that enable clients to manage end-to-end digital marketing experiences and activities. Backed by ORIX Private Equity, the agency offers a comprehensive set of professional services and technology products including social/digital marketing strategy and programs, social/consumer data analysis, content strategy and content distribution technology, and reporting and analytics – all geared toward customer acquisition. R2i clients include Microsoft, Under Armour, MasterCard, University of Michigan and Hershey’s. About CatapultWorks: CatapultWorks is an integrated demand marketing agency that specializes in combining creative campaigns and content with optimized data, media and teleservices to increase client revenue and drive higher customer engagement. Brands such as Chevron, Citrix, PG&E, ServiceNow, UnitedHealthcare have worked with CatapultWorks to activate existing customers and inspire new relationships. About ORIX Private Equity: ORIX Private Equity invests in middle market companies seeking equity capital of $5-25 million. ORIX Private Equity is a business unit of ORIX USA, a Dallas-based financial conglomerate with more than 1,400 employees and primary offices in Dallas, New York, Los Angeles, Columbus and Minneapolis. ORIX USA holds approximately $6 billion of assets and manages an additional $25 billion. ORIX USA is a wholly owned subsidiary of ORIX Corporation, a Tokyo-based, publicly owned international financial services company with operations in 28 countries worldwide. ORIX Corporation is listed on the Tokyo (8591) and New York Stock Exchanges (IX). For more, visit www.orixpe.com or www.orix.com.